Katniss wakes up from the sedatives dreaming of Peeta. She remembers when Peeta carried her to bed, back in District 12 before the Quarter Quell, and finally pieces together the word he muttered as she fell asleep: Always. Her emotions are dulled by morphling, and she wakes up, realizing she was shot, not by the man she was talking to, but someone else in the crowd. Johanna Mason shows up by her bed and steals Katniss’ morphling drip for herself. She tells Katniss she didn’t actually get shot, Cinna’s armor stopped the bullet; her ribs were bruised and her spleen ruptured, but nothing major. They talk a little about all the reasons why Johanna hates Katniss, and then Gale shows up. Gale knows that Katniss is upset at his actions in District 2, and he argues that killing people is just a side-product of war; instead of seeing it as murder, she should see it as saving other people’s lives. Katniss doesn’t buy it, because that way you could justify any killing, including sending children to the Hunger Games. They agree to disagree. 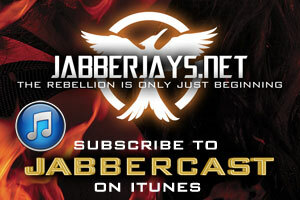 Gale tells her the rebels have District 2: after Katniss was shot, the people from Two turned on the Capitol soldiers. Later on, Plutarch explains how this actually gives the districts some time to regroup, because the Capitol is actually the one left scrambling, cut off from its support system. He explains the concept of “Panem et Circenses” and how the districts are now monopolizing both– the “entertainment” coming in the form of a wedding: Finnick and Annie’s. Despite Plutarch and Coin haggling over the budget, everyone in Thirteen takes happily to the event. Katniss takes Annie to choose from one of her Victory Tour dresses in Twelve. The ceremony goes off without a hitch and the people celebrate with music and dancing, and even Katniss takes a spin on the dance floor with Prim. The wedding cake is wheeled in, and Katniss recognizes it as Peeta’s handiwork. Haymitch explains that Peeta seems almost fine at some moments, but still goes off into rages from time to time. He made the cake under heavy guard, but Haymitch has talked to him without any problems, and he wants to see Katniss. She hesitates to accept, because she’d already come to the conclusion that she’d die in the Capitol and made her peace with not seeing Peeta ever again. But still, she goes to visit him, accompanied by Haymitch and a group of doctors. When she goes in, Peeta doesn’t seem hostile, but is very curt and almost insulting, so she gets defensive and replies to him just as harshly. But then he tells her he remembers the day he gave her the bread. He recounts the events of that day, and even those of the next day, the ones Katniss had never spoken about. He realizes he must’ve loved her a lot, and asks if she loved him as well. She can’t give him an answer. He brings up her trying to kill him in their first Games, and even the fact that she kissed both him and Gale. Katniss gets defensive again, and walks out. She’s upset that Peeta finally sees her for what she really is, and at the same time resents him for it. I think it would be pretty cool after Katniss is shot that there is a momentary scrabble to get to her to see if she’s okay as gunfire flies all around between the wounded and the Capitol. Not long enough for the annoying death fake out that you see in so many films these days (no one is going to believe Katniss is really dead within the first hour) but just enough time to get her to safety so there is real jeopardy involved. I’m very excited to see the reintroduction of Johanna and I’ve always found her dialogue in this scene at the hospital as very funny. I think it’s important aswell to show her using Katniss’ morphling. Addicition is another element of modern life that has been referenced and touched upon quite well in the series so far, so I hope Johanna’s coping mechanism by using is included. Katniss’ exchange with Gale is important too but I’m not sure whether it’ll take place in the hospital or somewhere else in a later scene. I would never want any scene with Philip Seymour Hoffman to be omitted but time will tell if his discussion with Katniss about Panem et Circenses and the nature of the Roman Empire was ever filmed. Technically, it’s not entirely necessary and may be a bit too obvious for some. While filming the propo of Katniss alive and well in hospital could be a good opportunity to discuss the plans for Finnick and Annie’s wedding and filming the celebration for broadcast. I’m not too worried about this wedding and if or how it’ll be adapted, the only thing I truly loved about it was the image of Katniss and Prim dancing. It’s of vital importance to see Katniss sharing a few happy moments with her little sister. Hopefully Mockingjay Part 2 will provide moments like this, after all Prim was the whole reason for everything Katniss has experienced in the first place. 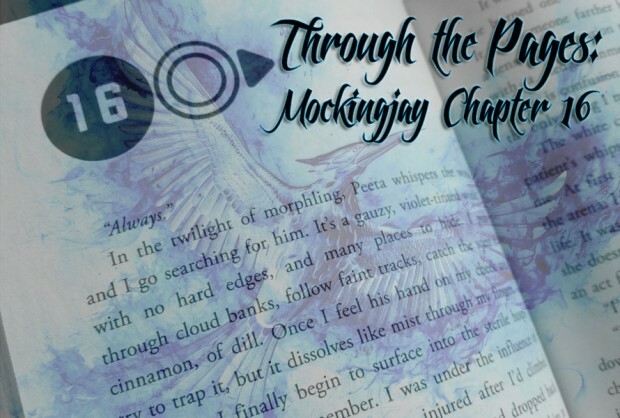 Chapter 16 is all about Katniss and Peeta in their first attempt to reconnect. I have absolute faith that the combined talents of Francis Lawrence, Jennifer Lawrence and Josh Hutcherson (might aswell throw in Woody Harrelson and James Newton Howard while I’m at it) will make this a very charged and compelling watch. It’s quite a loaded scene and hopefully it will be as equal parts touching and lamentable as it was in the book. Optimistically the wheels will be set in motion that after taking Peeta’s affection for granted, the audience will be praying that there is someway he can come back. So a lot happens in this chapter: Katniss and Johanna have a little reunion as Katniss heals, Katniss and Gale talk about how bloodthirsty Gale can be, Finnick and Annie get married (!) and Katniss has a real conversation with Peeta for the first time since his return. So, what am I most looking forward to on screen? I’ve been imagining Finnick and Annie’s wedding on screen for a while now, and I really hope that we get to see Katniss dance with Prim. I know it’s a bit late to demand this of the filmmakers, but please, please include Katniss dancing with her little sister. Obviously I’d understand if it isn’t included, but it would be nice to see before the events that happen later on in this book. I’m interested in how they will truly introduce Annie in the film. They’ve already established that she is a bit unstable in Catching Fire, so now it would be great to really show that on film. I’m also excited to see more of Johanna. Her little cameo in Part 1 left me wanting a bunch more out of her character. 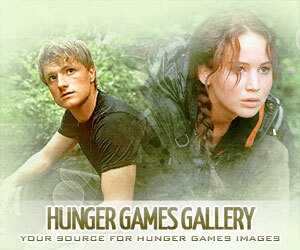 As for Gale–I’m hoping that they show Katniss confronting Gale about his actions in this film. Truly, I do. I don’t really care if it is how it is done in this chapter, either; as long as they show Katniss and Gale disagreeing on Gale’s morality in some way. (I really hope that I’m not setting myself up for disappointment right now). And, finally, Katniss and Peeta’s reunion. Honestly, I’m not too worried about this scene at all. It’s such a major one and they’ve done a great job at adapting Katniss and Peeta’s scenes so far that I have no worries about how their interactions will be portrayed in Part 2. We already know that they’ll be in there and while their conversations may not be word for word as they are in the books, I’m positive that these scenes and interactions will be outstanding to watch on screen. Before I start making predictions, let me state for the record that just reading through this chapter again makes me want to stab myself in the heart with a spork. I think a lot of this chapter is going to make it in, in broad strokes if not in detail. The conversation with Johanna at the beginning is one of my favorite Johanna moments of the whole series, and I truly don’t think they can afford to take it out without reducing Johanna’s role to a cameo. They have precious little moments with her to spare as it is, and I think most of them will make it in. I think they might take Katniss’ argument with Gale from this chapter and actually move it to the previous chapter, to the District 2 meeting, rather than having it here. But it’s important that they include it, because once again, it’s the best example of how Katniss and Gale’s ways of viewing war are fundamentally different, even if they both shared similar experiences in their early lives. Plutarch’s explanation about “Panem et Circenses” is most likely out; I think it would be a bit too much unnecessary exposition. The wedding will certainly be included, and I look forward to seeing the characters relax and be happy, even if it’s just for a little while. I don’t know that the cake will be included– I think they can segway into the conversation with Peeta perfectly well even without the cake. (Although, for selfish, eternally-hungry purposes, I would love to see what that cake looked like. Hey, if they can paint over Peeta’s arm to make it look like tree bark, then they can damn well give me an amazingly-decorated cake!). The scene with Peeta, however, will definitely be in the movie because how else are they going to stomp on our poor bruised hearts it’s a major breakthrough in Peeta’s recovery. They may take out small bits, such as the mention of their first Games, but for the most part it will play very similarly. The bread story will be touched upon, although there might be no mention of what happened the next day, since the dandelion thing has never been mentioned in the previous movies. I’m curious as to how they’ll play Katniss’ emotions in this scene, though; in the book, she gets really defensive and angry, even resentful, but I don’t think the scene would be very well received if they play it that way in the movie. My guess is they’ll make her seem more desperate and frustrated, instead; frustrated that Peeta is no longer the Peeta she knew. No doubt about it that Jennifer will knock that out of the park and we’ll all be sobbing copiously by the time this scene is over, but I’d love to have been a fly on the wall when they were filming this one, just to see what Francis Lawrence’s direction sounded like.